A vernal pool full of life and water. A close-up of the same pond now drying out in summer after all the amphibians have metamorphosed or gone dormant. 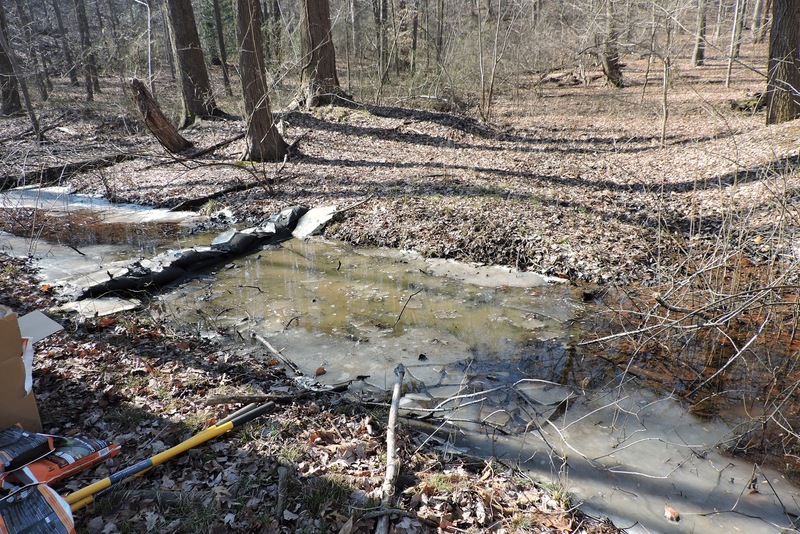 Vernal pools are temporary wetlands, ponds that form from melting snow/ice or early spring rains, but dry up during the hot summer. Some folks may wonder why these glorified puddles are so special, but they are actually a very unique type of habitat which support a whole array of specially evolved creatures. It is often the only place these animals can survive. 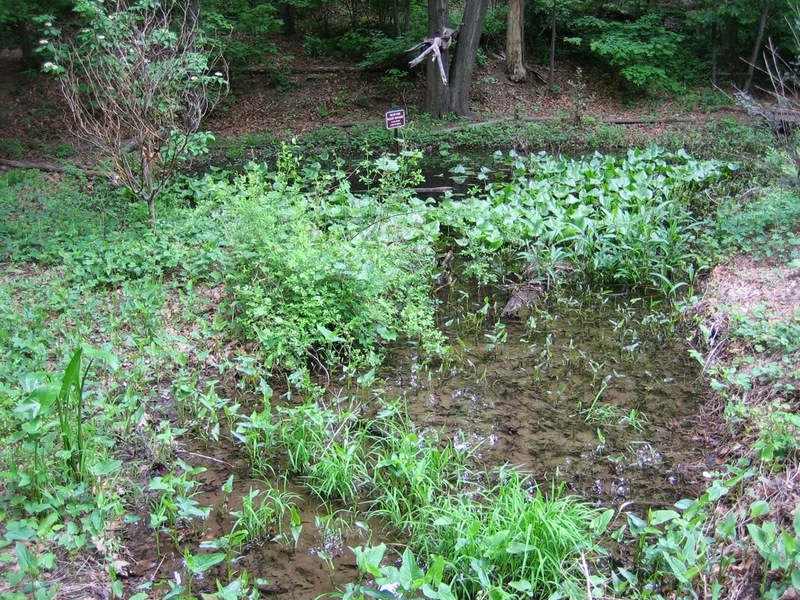 What makes these ponds so special is that they are relatively safe, sheltered, and lack many predators. Large aquatic turtles, snakes, frogs and especially fish cannot permanently live there. Some may discover them and visit, but it is a safe haven for whatever smaller creatures can take advantage of the temporary water. The biggest danger though is that most of these creatures have to be able to complete their life cycles before the pools dry up. Some years, many may make it, other drier years, none may survive. Since many vernal pool creatures are both long lived and reproduce prolifically, there are enough good years to make up for the bad years. So what are these vernal pool creatures? Well, the most often noted ones are certain species of amphibians, mole salamanders and wood frogs for example, but there are many others as well. Take for instance such tiny creatures and crustaceans as Water Fleas (Daphnia mostly), Springtails, and Cyclops. To most people these are just specks swimming in (or in the case of Springtails, on top) of the water. But these are favorite foods for other creatures. They escape most of these enemies by living in vernal pools, but they support other predators there. Just a bit larger are the Fingernail Clams. As you may guess, they are rarely the size of even a fingernail. They are adapted to surviving buried in the mud when the pond dries. All of these are mostly detritivores and scavengers, feeding off the fallen leaves and other things rotting in the water. My son shows an aptly named Fingernail Clam. What vernal pools are most well known for are certain amphibians however. These have adapted to metamorphosing quickly into air breathing adults before the pond dries up (at least most years). They also require for the most part an undisturbed woodland very near by to provide food and shelter for the adults. Without both elements, these animals cannot survive. One such amphibian and the most typical in our parts for vernal pools is the Wood Frog (Lithobates sylvaticus). As the name suggests, these black masked frogs live most of their lives in the woods, hiding under leaves or in other animals burrows. They are the most cold tolerant amphibian in North America, being the only New World frog found North of the Arctic Circle. They can tolerate extreme cold, capable of having sizable proportions of their bodies frozen with no ill effect. This is a necessary adaptation. Wood Frogs are the first frogs to emerge from winter dormancy (brumation), trying to get to the vernal pools early enough to give their young the best chance of long lasting water. They come out with the first relatively warm rains in spring, typically early March, but I've recorded them arriving as early as January 31. Being "cold blooded" (ectothermic), most frogs would die if the weather changed colder suddenly, as often happens in March, but not Wood Frogs. A pair of Wood Frogs in amplexus (mating position). The smaller males arrive first, forming a breeding chorus with their duck-like calls. The larger females arrive soon after and they pair up to lay their loose, jelly-like egg masses that can number up to 3,000 eggs each. The dark tadpoles metamorphose a couple of months later, the speed of development dictated by the water temperature, food availability, and water supply. They can speed up development, but only to a certain point. Other frogs such as Spring Peepers, Chorus Frogs, and Toads also make use of vernal pools, but none to the extent of Wood Frogs. Although primarily herbivores, wood frog tadpoles have been known to eat other tadpoles, especially toads. For more on Wood Frogs, check here: http://capitalnaturalist.blogspot.com/2016/02/wood-frog.html. 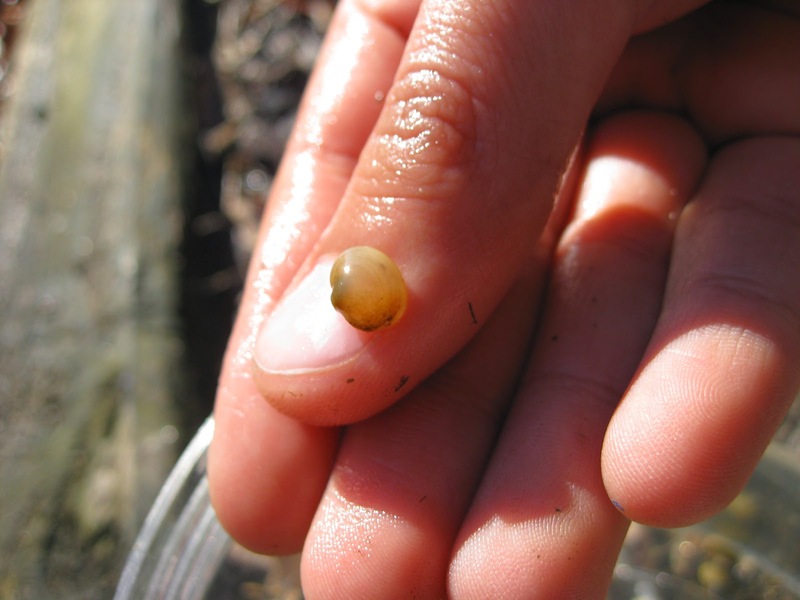 An aggregation od Wood Frog egg masses in a shallow vernal pool. Another group of amphibians that requires vernal pools to survive are mole salamanders. This family is termed this due to their living underground in other animals' holes for most of their adult lives, rarely seen above the surface. The various species need to find fishless pools to reproduce however and are out at the same time or just after the Wood Frogs become active. The most common ones locally are Spotted and Marbeled Salamanders. A Spotted Salamander being helped along its way to its natal vernal pool. Spotted Salamanders (Ambystoma maculatum) are aptly named, being large, dark salamanders with various spots on their backs. Males arrive to the pools first and wait for the females, presenting them with white sperm packets called spermataphores that may litter pond bottoms. Females lay firm, globular masses of up to 200 or so eggs, usually attached to a submerged branch or plant. These can be either white or clear, but soon turn green due to hosting a particular symbiotic algae species (Oophila amblystomatis) that may provide oxygen or camouflage for the eggs. The emerging larvae have mane-like gills and are extremely predatory. They not only eat small organisms such as water fleas and tadpoles, but anything smaller than themselves, including each other. In confined or crowded conditions, this cannibalism leads to only the largest ones surviving and few being found with out pieces or limbs missing. Salamanders display remarkable regenerative abilities however, so even missing limbs can be re-grown. If lucky, the adults can then live over 25 years. For more on theme: http://capitalnaturalist.blogspot.com/2014/03/spotted-salamandersa.html. A Spotted Salamander egg mass with developing embryos. The last vernal pool species I will discuss is the Marbeled Salamander (Ambystoma opacum). These are smaller than Spotted Salamanders and this would be a huge or even fatal flaw if they had not evolved a unique survival strategy. As you recall, salamanders are predatory and big salamanders eat smaller ones, so Marbled Salamanders would appear to be evolutionary losers. Marbeled Salamanders however get a competitive edge by laying their eggs first so their larvae are bigger at the onset and can even eat the others. How do they manage this when Spotted Salamanders come out so early and sometimes even in the snow? They actually lay their eggs not in the ponds, but where the ponds will be, utilizing dry vernal pools. Marbeled Salamanders lay their eggs in the Fall or Winter. seeking their dry natal pools and laying their egg masses about half way up the banks. When the rains and melting snows (hopefully) fill the pools, their eggs are already there and they can emerge first. They then have a brief time when they can eat anything else smaller than them born in the water. By the time the Spotted Salamanders begin to out grow them, most have metamorphosed into air-breathing adults and have returned to the woods. 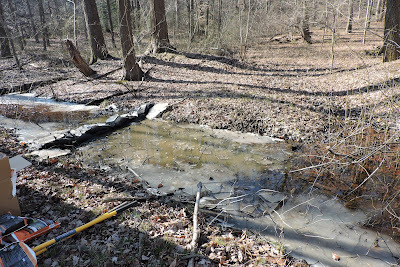 Vernal pools can be created in the right habitat. 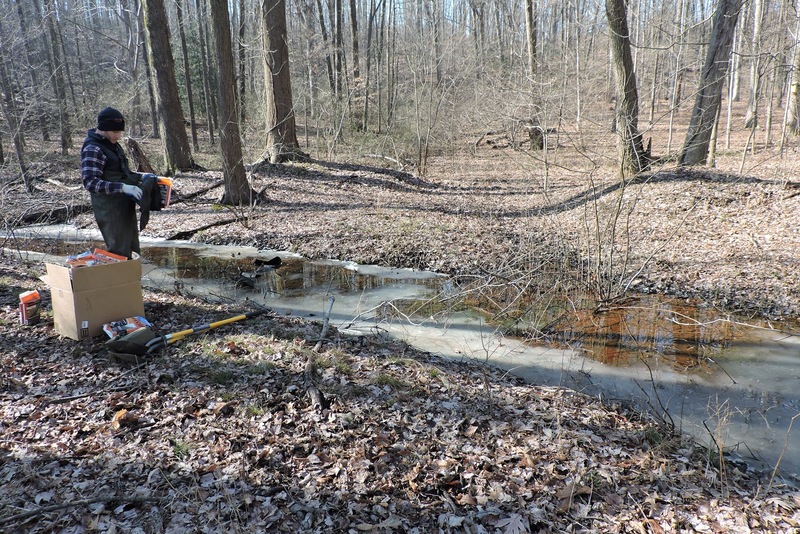 Here you see us using quick dams to build temporary vernal pools specifically to serve as breeding pools for amphibians. A newly completed vernal pool, partially stalling water that drains from 2 locations to form a shallow temporary pool.